Cat Gethr, ridden by Kody Porterfield. Hart Photography. Wednesday, November 28, Fort Worth, Tex. Kody Porterfield, showing for J.C. Jackman, Clewiston, Fla., scored 223 points on Cat Gethr to win Wednesday’s NCHA Futurity Limited Open championship. Greg Wright claimed the reserve championship with 219 points, riding Reycan In The Cash for Eric Freitas, Santa Maria, Calif., while Rodrigo Taboga placed third with 218 points on The Dewd for Alvin Fults, Amarillo, Tex. Kody Porterfield’s mount, Cat Gethr, a red roan Metallic Cat daughter, is a three-quarter sister to Roamin Cat ($116,320), by High Brow Cat , and out of Love A CD, by CD Olena. 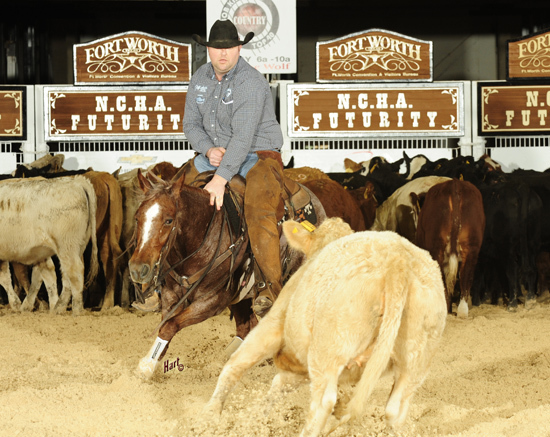 Porterfield, the NCHA earner of $244,002, won the 2015 NCHA Futurity Limited Open and placed third in the Futurity Open on This Isa Third, by Third Cutting. He also placed as a finalist riding in last year’s NCHA Futurity Open and Limited Open aboard Fancy Cutting, a Third Cutting daughter that he has shown as a finalist in three limited age events this year. Reycan In The Cash, ridden by Greg Wright. Hart Photography. Greg Wright and Reycan In The Cash, by Dual Rey, marked 218 and 219 in the Open go-rounds to earn the fourth highest cumulative score. The sorrel stallion, out of Cancan Kitty, by Highbrow Cat, is a full brother to Cancan Reyvolution ($176,682) and Kitty Can Dual ($108,297). Kelle Earnheart showed Cancan Reyvolution to place third in the 2010 NCHA Futurity Non-Pro Finals and Kitty Can Dual to placed third in the 2014 NCHA Futurity Non-Pro Finals. 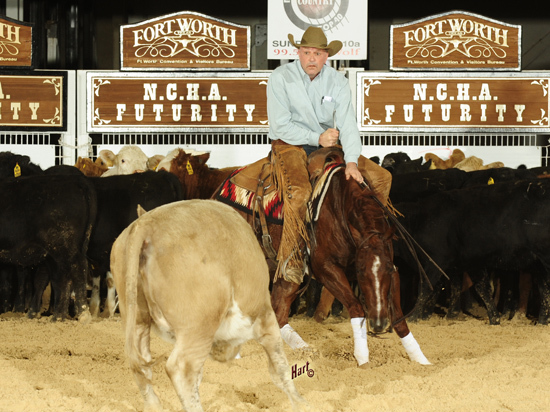 Wright, the NCHA earner of $813,391, was a finalist in last year’s NCHA Futurity Limited Open riding Sugarush, by Kit Kat Sugar. The pair also placed third in the 2018 NCHA Super Stakes Limited Open, and were finalists in the NCHA Derby Limited, as well. In addition to Reycan In The Cash, Wright also showed Crown That Cat, owned by Star C Land & Cattle Co., to qualify for the Open Semi-Finals on Saturday, December 8. Rodrigo Taboga claimed his first NCHA earnings in a big way on Wednesday, riding The Dewd, a Metallic Cat gelding, and a full brother to five earners of over $100,000 each, including 2017 NCHA Open Horse of the Year Metallic Rebel ($411,837). Alvin Fults, breeder of The Dewd, as well as of his full siblings, also owns Warlock, a full brother to The Dewd, and a leading qualifier for the Open Semi-Finals with Beau Galyean. It was Galyean, winner of the 2008 NCHA Futurity Open on Fultz-owned Metallic Cat, who also trained and showed Metallic Rebel.